1) PH released an 8 CD box of live performances on 29th March 2019. The songs were recorded in Europe between November 2017 and May 2018 and the set is called "Not Yet, Not Now". 2) Cherry Red are producing an Aerosol Grey Machine box to be released on 26th April 2019. 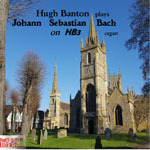 Hugh Banton has a new classical album out: Hugh Banton plays Johann Sebastian Bach on HB3. Click on either image for details and to buy. PH: "Last time I posted something here I was in the process of working through live recordings from the last set of tours. On the 30th of November the (first) fruits of these labours will be released. It's a somewhat unusual set of songs. The tracklisting is, of course, identical to that on the original album. In a nod to that first CDR, the title is X/Ten". Buy here. M.I.G. Music have released (25th May 2018) a DVD and CD set of the Leverkusen show from 5th November 2005. Buy Here. 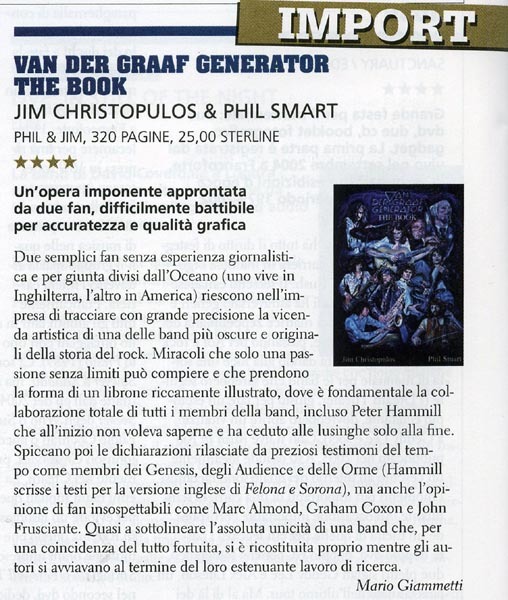 King Crimson Meets Van der Graaf Generator! "Hi Fidelity resurrects more crates in the attic classics including Roxy Music�s Avalon, Mike Oldfield�s Tubular Bells, 10CC�s I�m Not In Love and the immortal Van der Graaf Generator�s Theme 1." 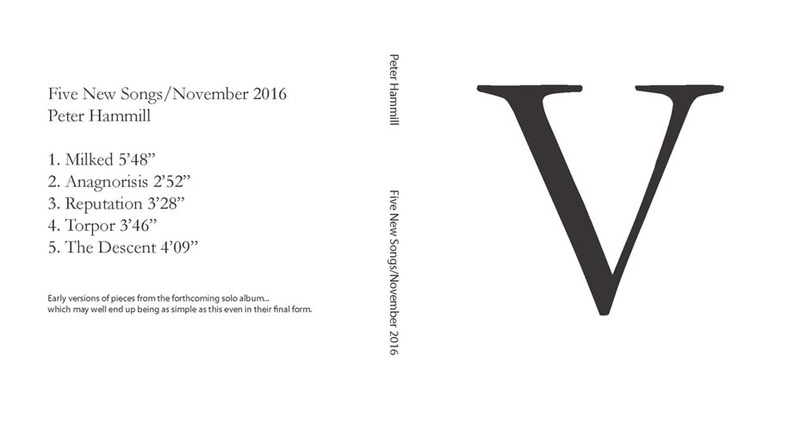 Peter Hammill: "At long last the latest solo album is now finished and ready for release. It's titled From the Trees and will be out - on Fie! as ever - on November 3rd 2017. I've played and sung all the parts on the disc, as so often of late. There are ten songs, all at the short end of things and probably as close to conventional song structure as I get. I have, of course, already played quite a few of these live." 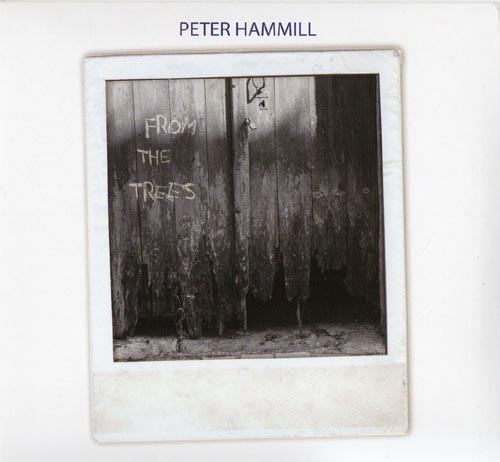 The new Peter Hammill cd, From The Trees, could have been called Anagnorisis (you have to settle for a mere song with that title rather than the CD as a whole), as the tragic characters in many of these pieces experience an awakening, a moment of discovery where long held beliefs relating to their situations and what works for them are revealed to be misguided facades / falsehoods that result in emptiness, nonfulfillment, and contemplation of where it all went wrong. In "Reputation", it's sought-after fame and fortune that ultimately leave the protagonist devoid of happiness; in "Charm Alone", it's one's predilection for masking his true feelings and intentions, thinking he can get by on his charming personality; in "Milked", it's a performer (possibly) who had the 'it' factor, revelled in it, and could "charm the birds from the trees" but loses his significant other (and thereafter everything else) as a result and unravels, wondering at the swiftness of his fall from grace. Peter has described the characters here as edging toward twilight and residing in the "third act of life", so they don't even have the comfort of catching their mistakes in their youth with ample time to correct the ship. One would choose to make and realize their follies in their 20s or 30s rather than their 60s or 70s. Of course, better late... (maybe). This could be terribly depressing in the wrong hands, but (as ever) Hammill pulls it off with such grace, power, honesty, and conviction that, paradoxically, the net result is immensely satisfying. These songs may not recall "Joy To The World" but neither do the great literary tragedies we still celebrate, enjoy, and love today. And there is much to identify with here, regardless of one's age. "Torpor", in the context of the rest of the album, could be describing the rigors of senior citizenry, but on its own it describes in acute fashion the exhaustion anyone feels during a particularly trying period in their life. And you don't have to be in the twilight of your years to mull over a former flame, wonder where she/he is now, and come to the realization that the romanticizing of the relationship manufactured a situation in your mind that wasn't grounded in reality ("Girl To The North Country"). The man has no equal as a lyricist and for those who take the time to delve into From The Trees' collection of poignant musings and tale-telling, the rewards are abundant. Intelligent, well-crafted lyrics demand corresponding music and, as is to be expected with a Hammill album, there is no unequally yoked coupling here. The songs on From The Trees can stand with any of the "classic" stuff he did in the first / second acts of his performing career. It's absolutely amazing to me that I can pop this cd in and have to replay a tune three or four times before moving on because it's grabbed me that much. But that happened with the second song, "Reputation". I'm very familiar with the whole (almost) 50 year Hammill / VdGG catalog (all of it) and I can honestly say that "Reputation" is one of my all-time fave PH tunes, from any era. I didn't see that coming, and it's wonderful that it's the case. There is something infectious about the piano chords, played waltz-like, coupled with the theme of the lyrics. It just grabbed me, and continues to do so. But other tunes are not far behind. "Anagnorisis" is the sort of wistful, beautiful piano piece that Hammill excels at and, like all the others from this collection, is right up there with the classics of the (distant and recent) past. Elsewhere, some truly great guitar work augments various murky tales and offers up infectious rhythmic backing on "My Unintended" and "Charm Alone", while the technical proficiency (and sensitivity) on display in "Torpor" and "Milked" works tremendously. There are real chops and maturity in his playing and, while no one would ever confuse his guitar prowess with that of Al Dimeola (nor would PH ever claim or intend to be as such), the A level performance is notable. And then there are the vocals. To me, he sounds as good as he's ever sounded on this disc. As ever, if you didn't know that he collaborated with himself on multi-layered backing vocals, you'd think he had other singers come in to accompany him. Such is the vaunted Hammill range of styles, and it's great to hear someone at this stage of the game still able to deliver the goods vocally (such is not the case with many of his vocalist contemporaries from the late 60s / 70s). Peter sings and plays all the instruments himself. The arrangements range from stripped down to quite lush (although they can sound deceptively sparse), a good example of the latter being the track "What Lies Ahead" with its piano, guitar, bass, and multi-vocals melding into a rich soundscape. The arrangements work nicely and are never overbearing. Indeed, despite the multi-layering of some sections, there is an inherent live-ness to the proceedings that make the tunes pop. As Peter Hammill approaches the half century mark of a groundbreaking, wholly unique career in musical trailblazing, we should pause to reflect on just how successful he truly is (at least in artistic terms). While we cut some slack to many legends who are still recording after several decades and accept that they'll never be as good as they were, we don't have to patronize Hammill with any such lowering of the bar. On From The Trees, he's as good as he ever was, which is saying a whole lot. Now there's a reason to actually celebrate and feel good about a person still with us in the twilight / third act of his career. No anagnorisis or O Henry twist here... he's been spot-on the whole time and continues to be so. There are contributions from Hugh Banton and David Jackson. Available from Amazon UK and Amazon US. 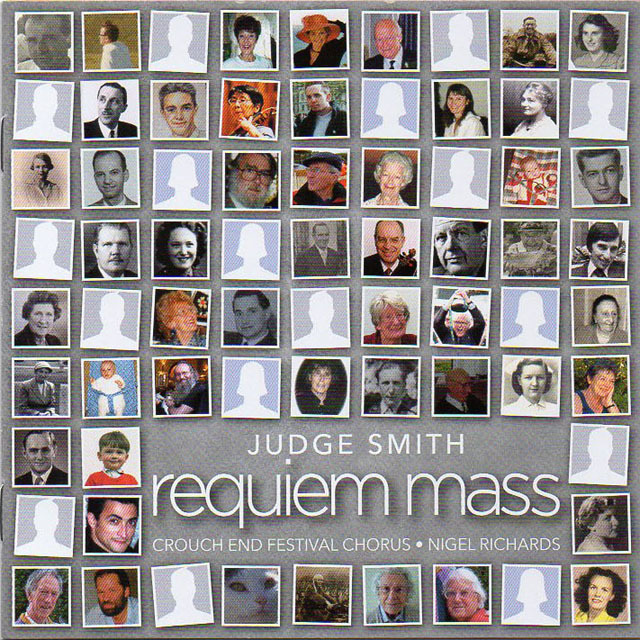 Judge Smith finally realeased his "Requiem Mass", written in 1975. 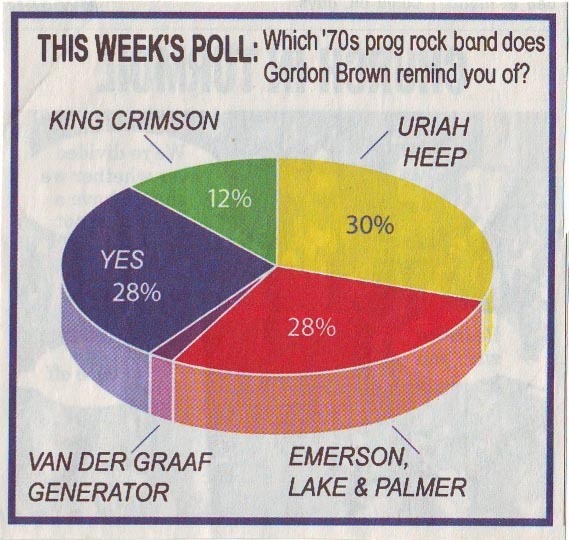 Described as a "lost prog rock masterpiece", this rather good CD can be ordered from www.judge-smith.com. PH has released a limited edition CD sampler of his forthcoming solo album. Only available in Japan in November, it sold out. Click on image for the track info. 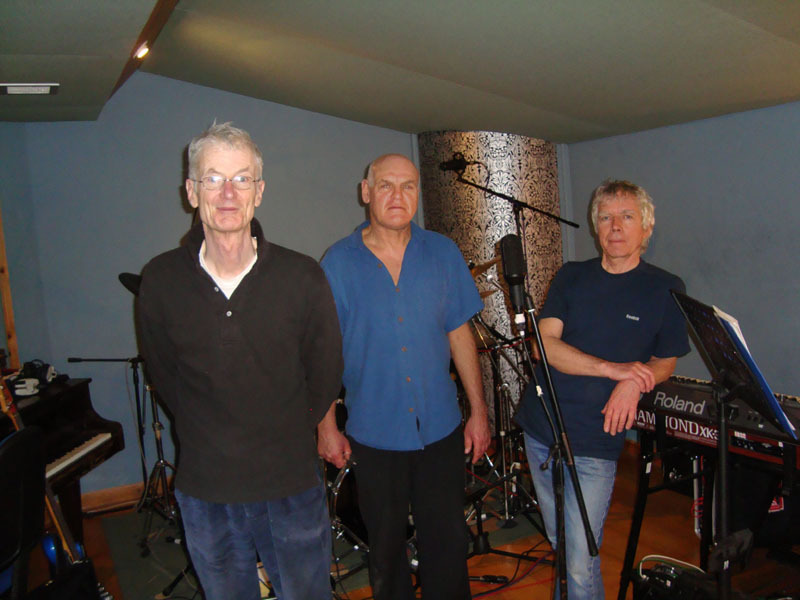 David Jackson appears on an excellent new album by Tony Lowe and Mark Brzezicki's ESP Prog Band - 'Invisible Din� More info. 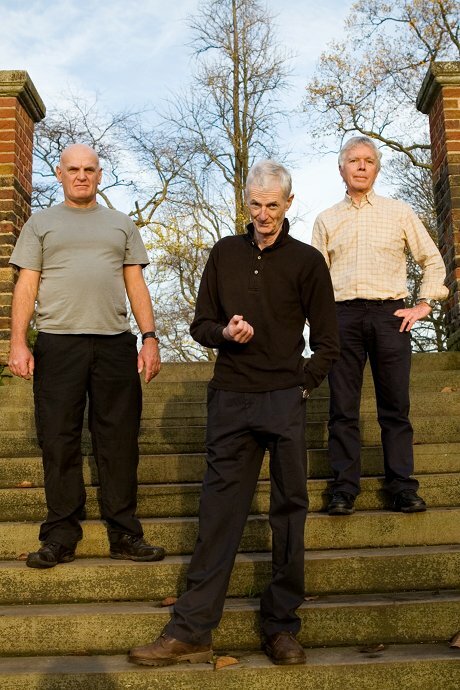 Peter Hammill was interviewed on BBC's Freak Zone on Sunday September 18th at 8:00pm (UK time). The K Group Rockpalast show from Hamburg Markthalle on 26th September 1981 was released on DVD on 26th August. Click on the image to order from SofaSound. 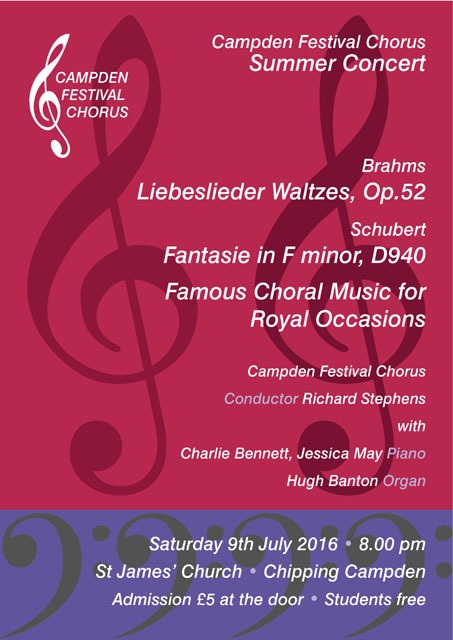 Hugh Banton played again at the Chipping Campden Festival Chorus summer concert on July 9th, this time playing organ. HB before the event: "This is the first time I have accompanied live choral music upon organ literally since 1967." 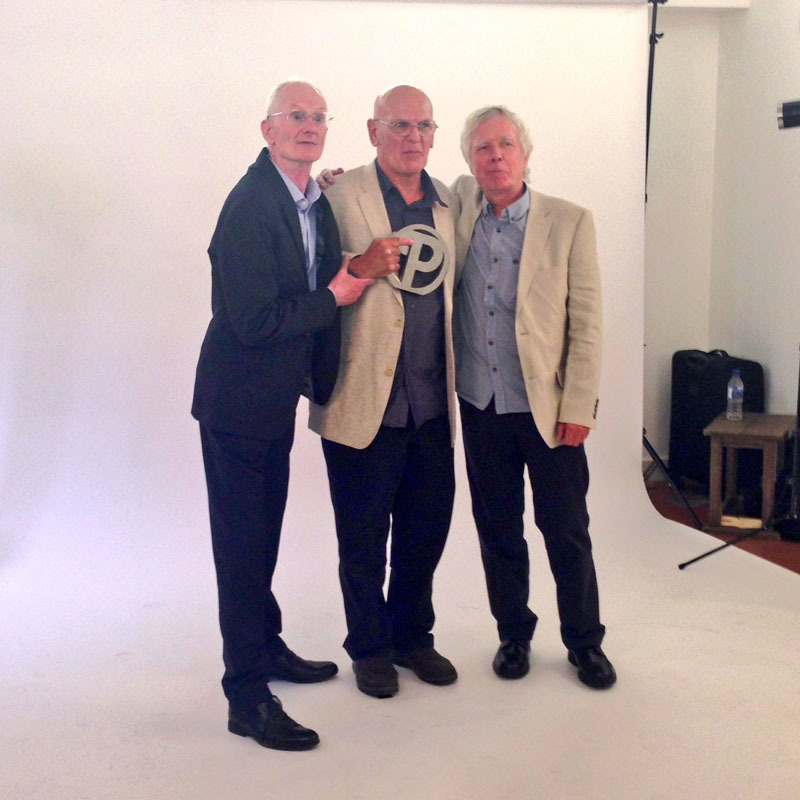 HB was also on the performers list for this on July 15th at the Cheltenham Music Festival. HB played on the Friday on an old upright piano. Herman has digitised his Cats Eye Promo. MOJO - info about the forthcoming new studio album. Guy Evans interview on the New Untouchables website Part Two. 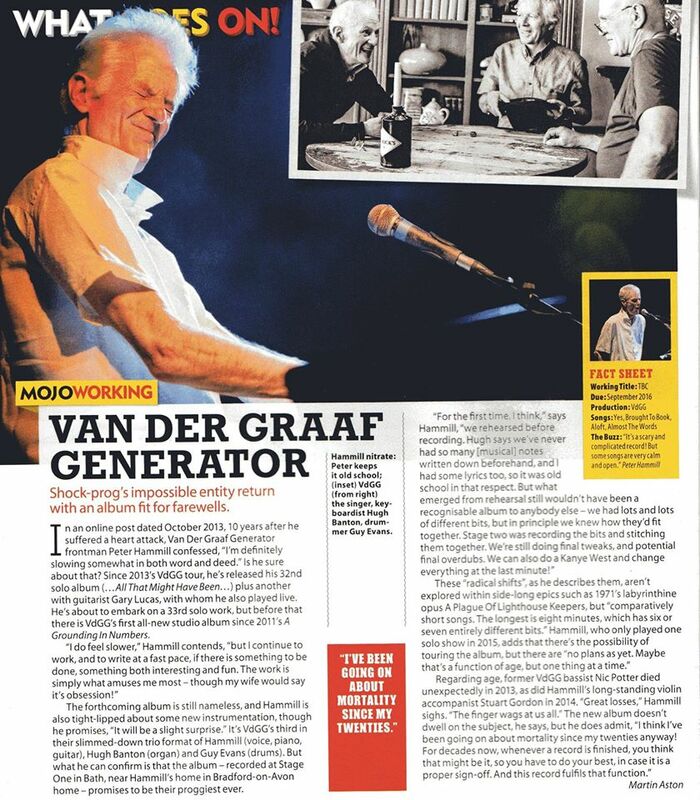 Carl Wilson, long time member of the VdGG road crew, has released a photo book entitled "Van der Graaf Generator at work.........technically". Click on the image for more info. 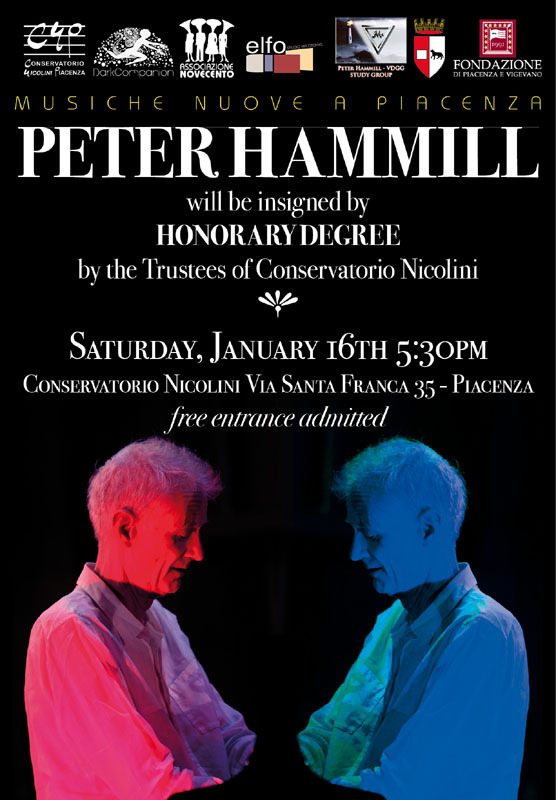 PH was awarded an honorary degree in Italy on January 16th. Click on the image for more info. He also performed a short set. 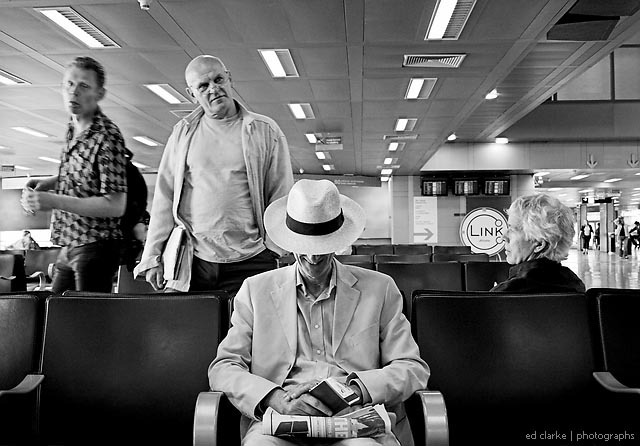 PH: "Finally, yes, I have been and continue to work away. I'm in writing mode, heading toward both the next solo disc and the next VdGG one. It'll be awhile before either of these get properly under way, mind..."
"We're now well into the recording of the next studio effort, which is sounding very exciting indeed. 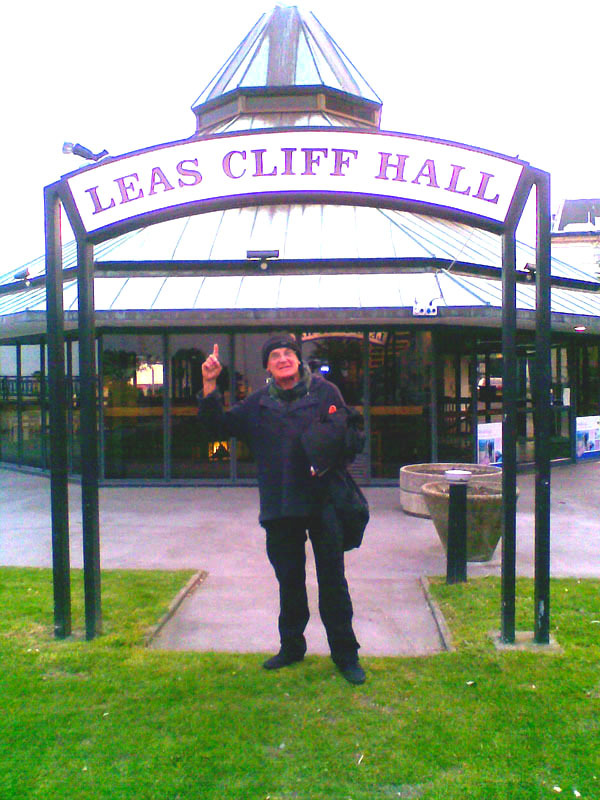 It'll be out in 2016 and of course I'll write more about it in due course..."
Guy Evans re-visits Folkestone's Leas Cliff Hall. The Live List has VdGG playing there on 15th August 1970, 5th February 1972 and 13th May 1972. Universal released a double CD of VdGG BBC sessions on April 27th. The CD is called "After The Flood" and covers the periods from 1968 to 1977. VdGG's new live album, recorded during their 2013 European tour, is called "Merlin Atmos" and was released on Feb 2nd 2015. The album is out in 3 physical formats: single CD (CD1), double CD, and a special vinyl gatefold edition containing the main events - 'Flight' and 'A Plague of Lighthouse-Keepers'. PH: "...the fruit of my recording labours over the last months is also going to be released at the end of November. "The title is '..all that might have been...' and it comes in a number of different formats." See Sofa Sound for more info. Sadly, former PH violinist Stuart Gordon has passed away. 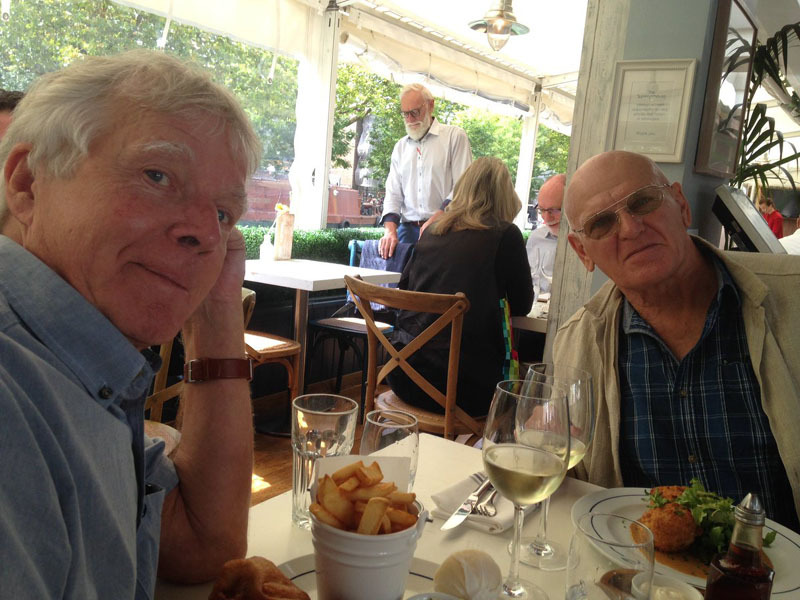 PH: "I'm sorry to have to report that after a short illness my dear friend Stuart Gordon died late last night, 28th August. 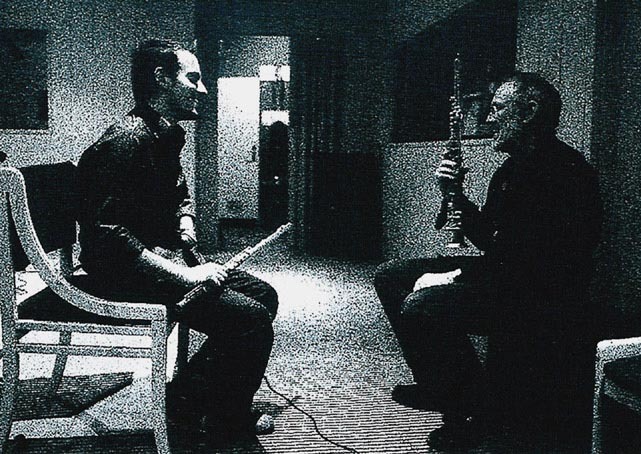 "I had so many adventures with him in music and in life and his loss is nigh unbearable. "I have no other words for now." As a tribute I have made available PH and SG's rendition of "Comfortable?" from The Bottom Line, NYC in Nov 1999. 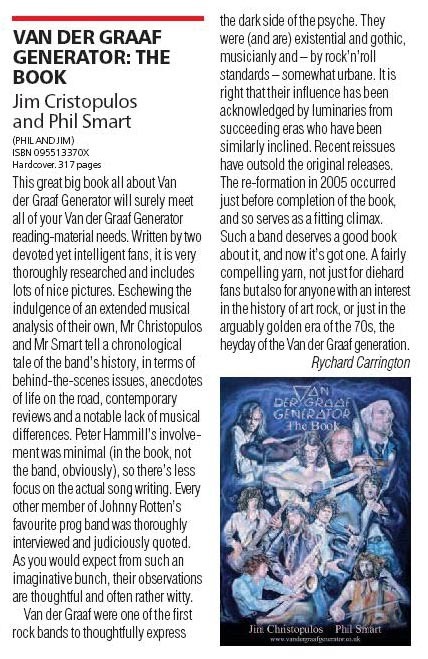 The hardback version of Van der Graaf Generator - The Book has sold out but a text version remains available on Kindle UK and Kindle USA. 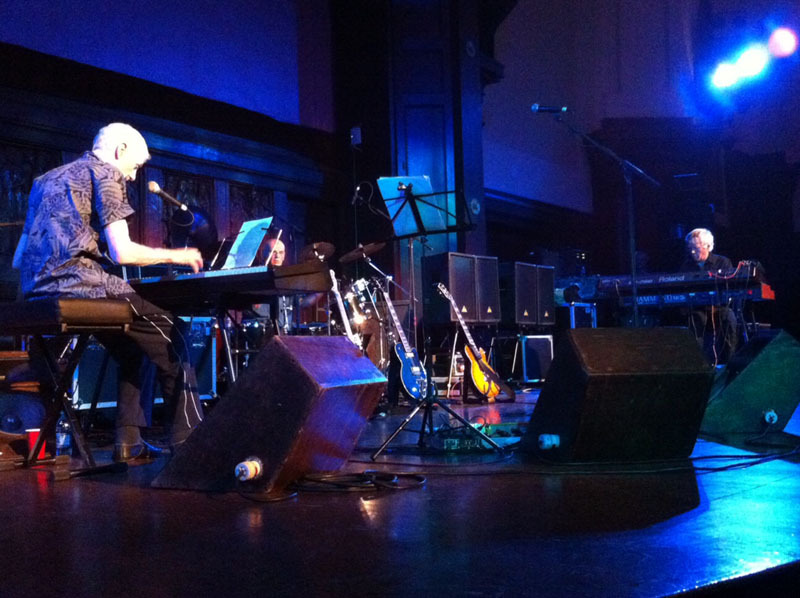 Peter Hammill and Gary Lucas have collaborated on a new album titled "Otherworld", released on 3rd February 2014. David Jackson appears on a new CD of contemporary chamber music released by Ricardo Odriozola. It is called "DRAGNING - CHAMBER MUSIC BY KENNETH SIVERTSEN"
Peter Hammill made an appearance in Italy on January 18th 2014 (click on poster for details). 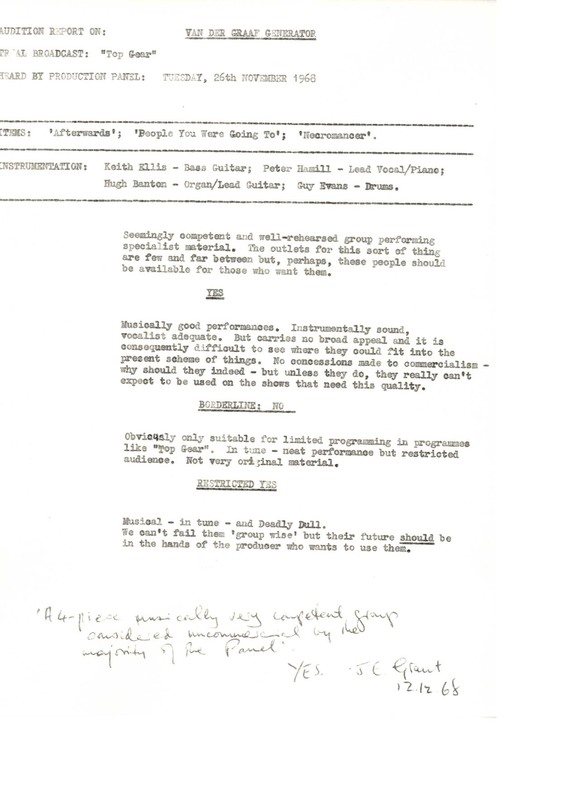 "Pete Paphides delves in the BBC archive to reveal audition processes for aspiring bands and artists to gain radio exposure in the 1950s and 60s, among them the Rolling Stones, Elton John, the Who and Pink Floyd. Plus, musicians including Peter Hammill of Van der Graaf Generator, Judy Dyble of Fairport Convention and Alvin Stardust discuss their recollections of these sessions." PH Wins Visionary Award (2012). What prog-rock albums should politicians listen to? COUNTDOWN 2 APOCALYPSE by Graham Smith, the sequel to At Risk... A Perfect World is out now on Amazon Kindle. "A philological and musical journey through the VdGG albums; as the subtitle of the book suggests: 'descent into the progressive maelstrom'. This book is not just the enumeration of events but a point of view about musical matters offering some secrets of one of the most original bands of the 70s. Coralli's musical transcriptions help the reader (and VdGG fan) to understand the Hammill methods of composition, as well as the instruments (as we can read through the Hugh Banton interview which discovers some forgetten background about the 'Pawn Hearts' sessions). "Michele Coralli is a journalist specialising in music who deals with contemporary music and classic progressive rock. This is his second book following 'Swingin� Canterbury. Viaggio nella provincia del rock progressivo britannico 1967-1981'." Click here to order (In Italian). 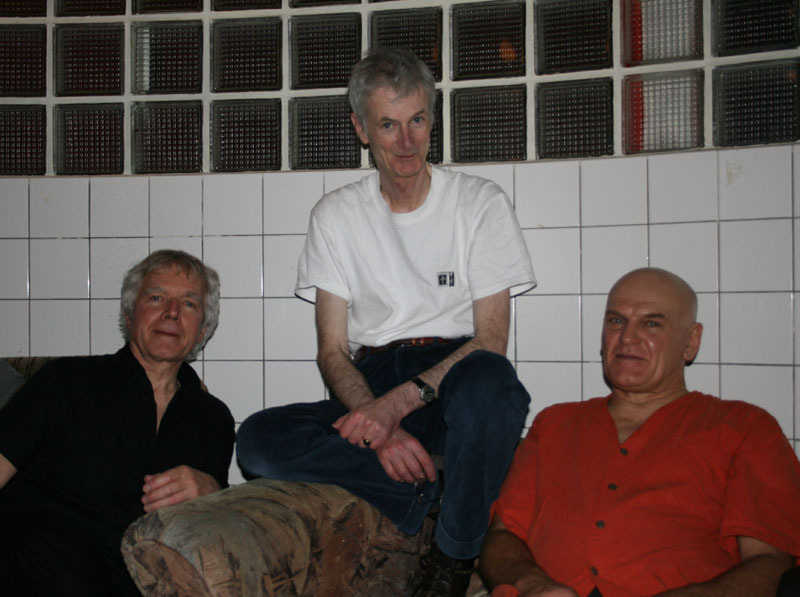 Van der Graaf Generator June/July 2013 European tour! 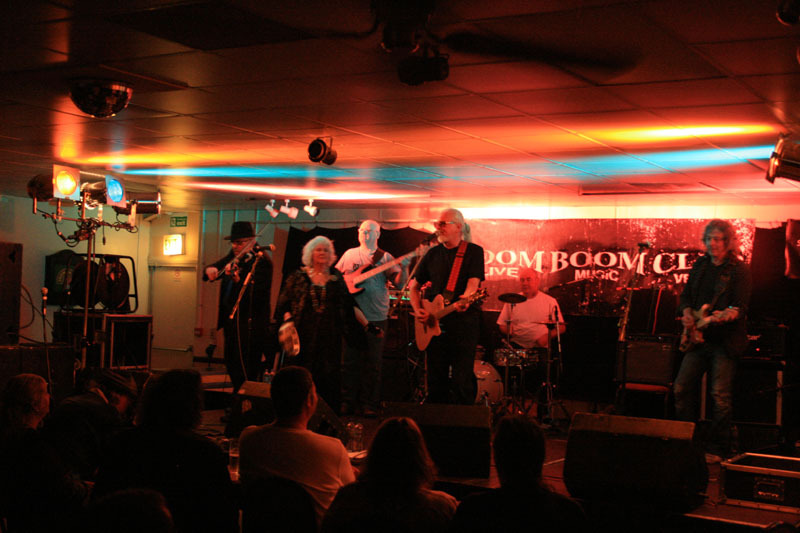 See the Live List for the recent shows. "VdGG will be performing a couple of long-form pieces at the core of their sets in their upcoming June dates. "Flight", originally a PH solo/K group piece, has already been aired in North America and Japan last year. It's partly as a result of the reworking of this in the trio format that we've been tempted to go for something even more ambitious...or dangerous. Our intention is to play "A Plague of Lighthouse-Keepers", from our 1971 album "Pawn Hearts" each night. We will not be attempting to recreate the album version but hope to come up with a new, in-the-present approach to this important piece from our past, which has only been played live a handful of times before now. It's a scary prospect, but very exciting!" Judge Smith has a new album out called Zoot Suit. "Judge's 11th solo release is an album of songs, and only his third full-length collection of songs in twenty years. Featuring the spectacular arrangements and production of David Minnick, and some amazing American musicians, 'ZOOT SUIT' is perhaps Judge's most accessible and downright entertaining album to date." Click on the image for a brand new, in-depth interview with Peter Hammill on Innerviews. 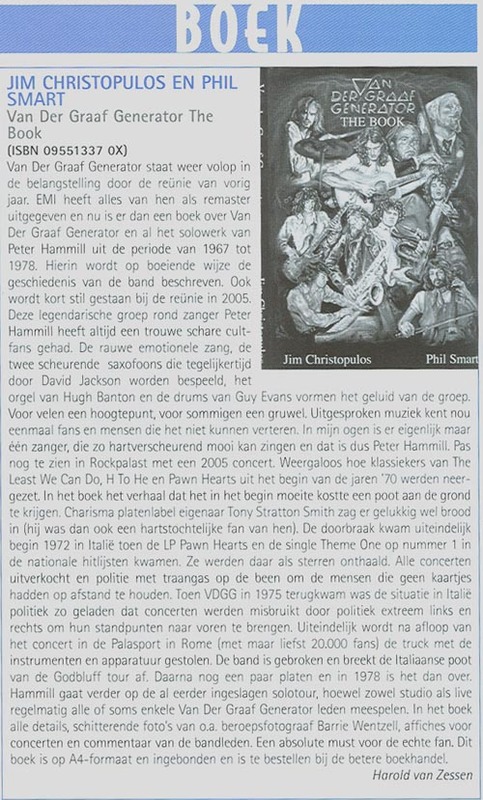 "It's a comprehensive look at much of Hammill's recent and forthcoming activity, both as a solo artist and with Van der Graaf Generator." VdGG were massive in Italy during the early 70s and there remains a thriving Italian fanbase. Paolo Carnelli: "Though 40 years have passed, there was still a chance to be able to track down some of the Italian people who were involved with the band at the time: musicians, opening acts, managers, writers and, of course, fans. 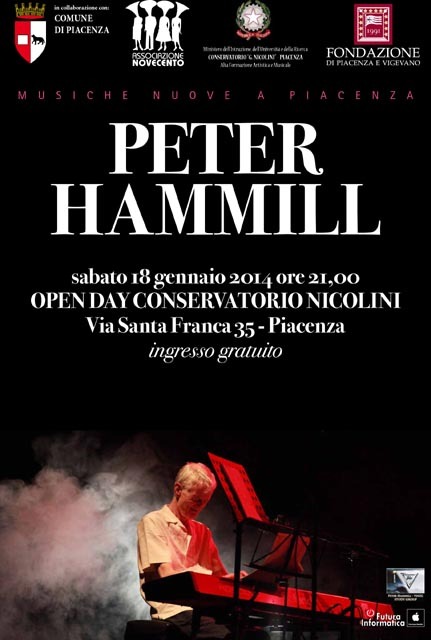 As the work went on, it was clear that there were some pretty interesting stories to tell, especially the ones related with the collaboration between Peter Hammill and Italian band Le Orme, the very first years of Hammill's solo career and the making of the Long Hello album, which was deeply linked to Italy. The core of the book deals with the 1972/1975 period." Contributions from current VdGG and David Jackson. In Italian. Graham Smith's first novel has a change of title and cover and is now called "AT RISK... A PERFECT WORLD". Those who do not have a Kindle can download a free app from Amazon. If anybody has the older version, there is no difference in content, apart from a few words; but they can obtain the new version by contacting tech@thepowerofgray.com and submitting their Kindle address. Elbow's Guy Garvey talks to PH and others about sequencing: Listen here. Sadly, former VdGG bassist Nic Potter has passed away. More here including a link to an obituary and a tribute from Guy Evans. David Jackson in collaboration with Le Jury has released a new album entitled "Jaxon Faces The Jury". Le Jury are a three-piece from Bergen, Norway that include Ricardo Odriozola, the talented musician who co-wrote "The Musical Guide to Pawn Hearts". Buy the CD here (postage included in price). 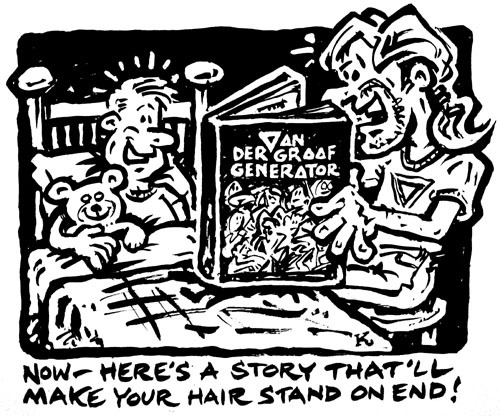 V is for Van der Graaf Generator! at Progressive Music Awards ceremony. on June 28th 2012. Buy the CD here, the LP here. Check out the Live List for the tour of North America! Van der Graaf Generator Live At Metropolis Studios was released as a 2CD/1DVD set by Salvo/Union Square Music on June 4th. Thanks for all the competition entries - the winners reside in the UK and France and have been notified. 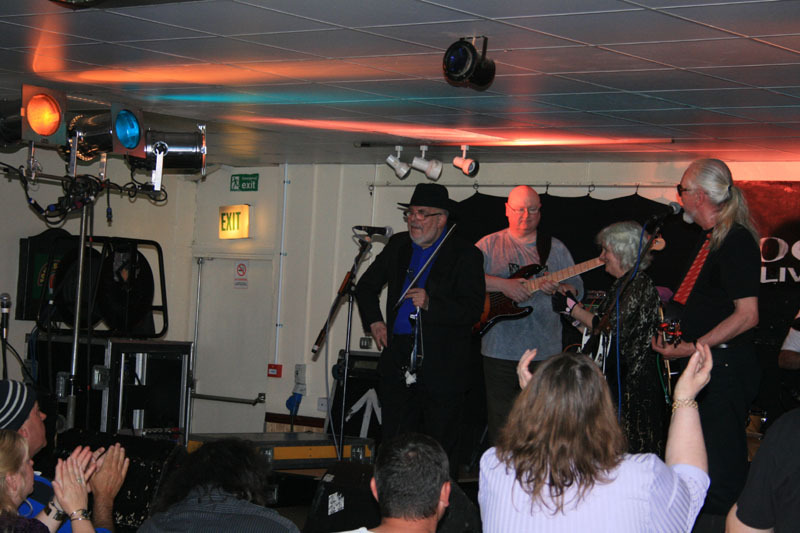 String Driven Thing (above) featuring Graham Smith played a gig in Sutton, Surrey on May 13th to celebrate the 40th anniversary of their signing with Charisma. 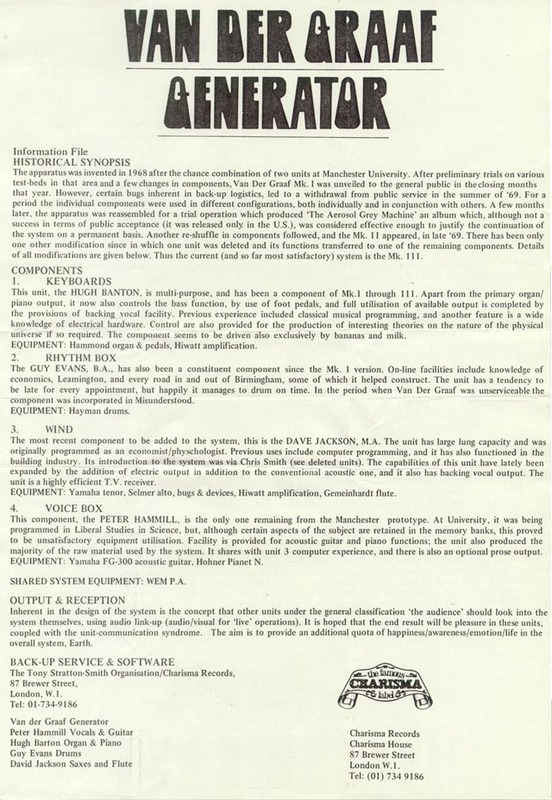 They have also released a live CD from the 72/73 Genesis Foxtrot tour. Details Here. There is a 5 page piece and interview with PH in May's MOJO magazine. PH's new album "Consequences" was released on April 16th. - Buy Here. A new live box set release by PH: "Pno, Gtr, Vox Box" is out now - Details Here. 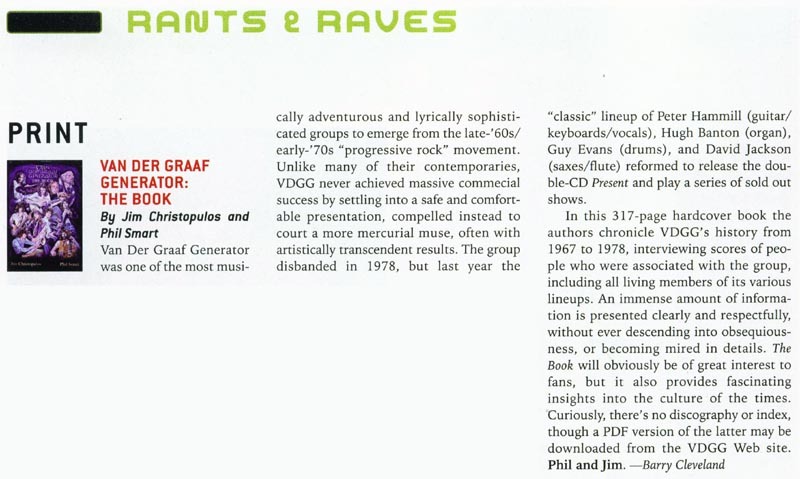 Scott Faragher's new book "The Hammond Organ" features a section on HB and VdGG. Click on image. A new double CD live release by PH: "Pno, Gtr, Vox" is out now - Order Here. "This Too Shall Pass", the new album from the Subterraneans, is available for free from Here. David Jackson appears on the new album from Stelios Romaliadis called Meadow Rituals. 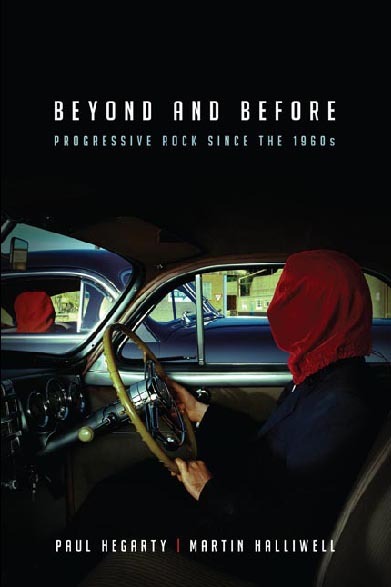 A new book published is Paul Hegarty and Martin Halliwell's Beyond and Before - Progressive Rock since the 1960s. Information and a downloadable sample can be found here. 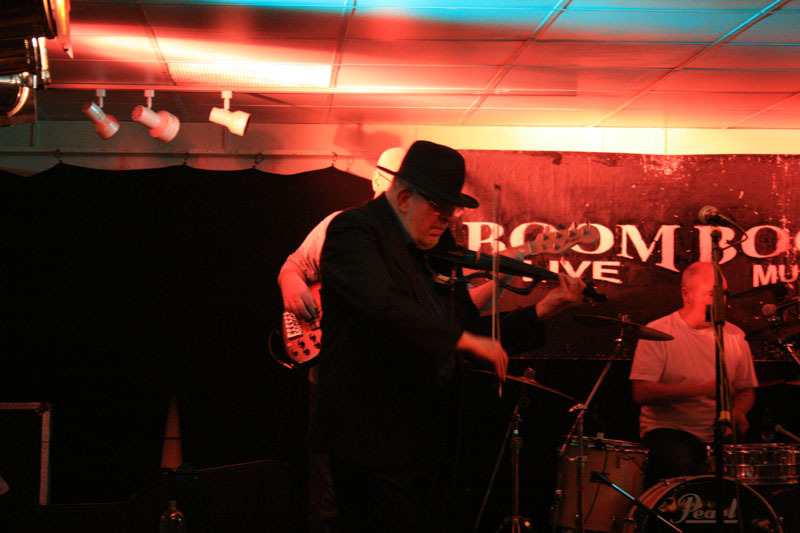 visit The Live List - 2011. VdGG Italian Special on RAI 5. 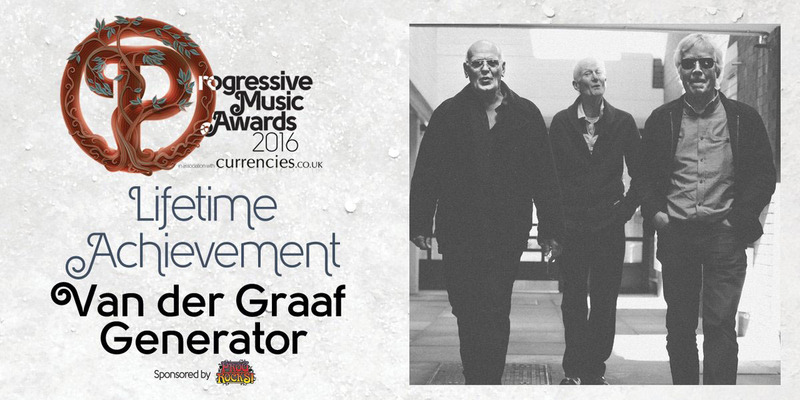 The new album from Van der Graaf Generator is out now and is entitled: "A Grounding in Numbers". 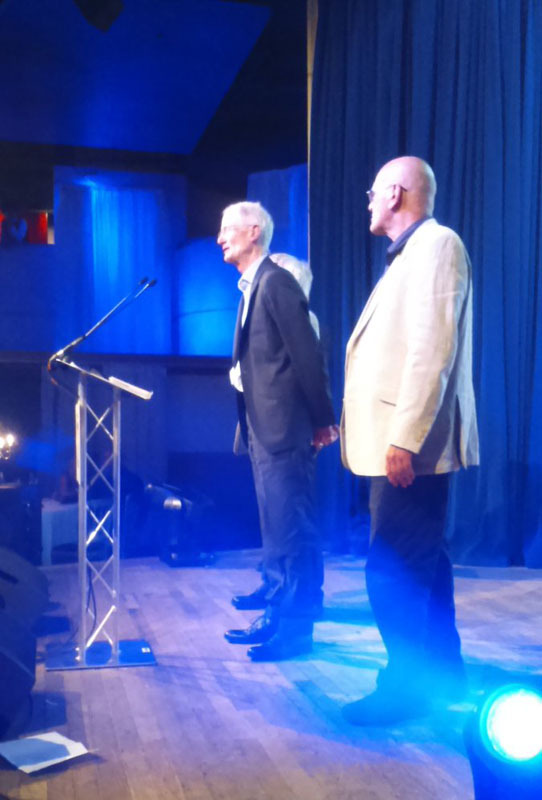 The Grounding page includes an interview with Peter Hammill who also did an interview for the Barbican website. You can read about the making of the album on SofaSound and hear clips here. There is an interview with PH and HB on the French Lost and Found website (in English and French). The CD can be ordered from SofaSound. For International Record Store Day on 16th April, Esoteric put out a limited edition single of "Highly Strung" with B side "Elsewhere". 2011 Easter European tour is over! VdGG at Propagation House studios in April 2010.
or Here for the CD. 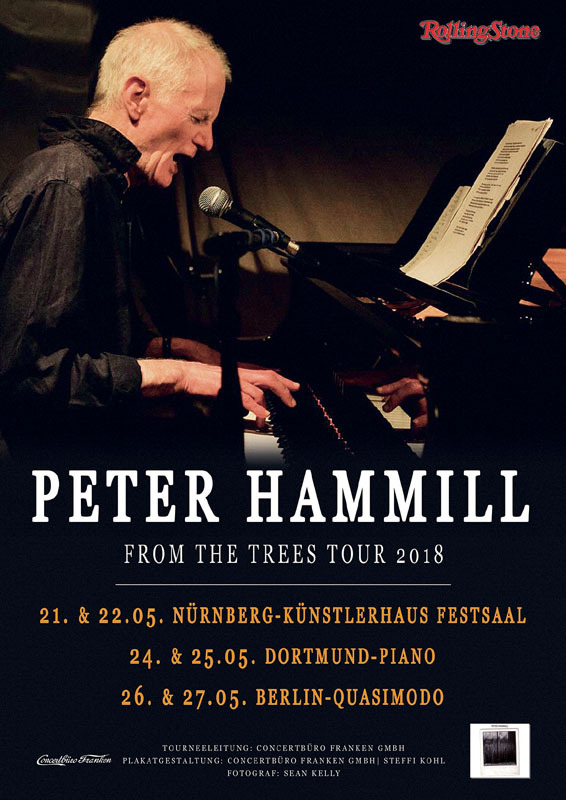 The DVD of Peter Hammill's 1992 Passionskirche solo performance is now available on Voiceprint. Buy Here. 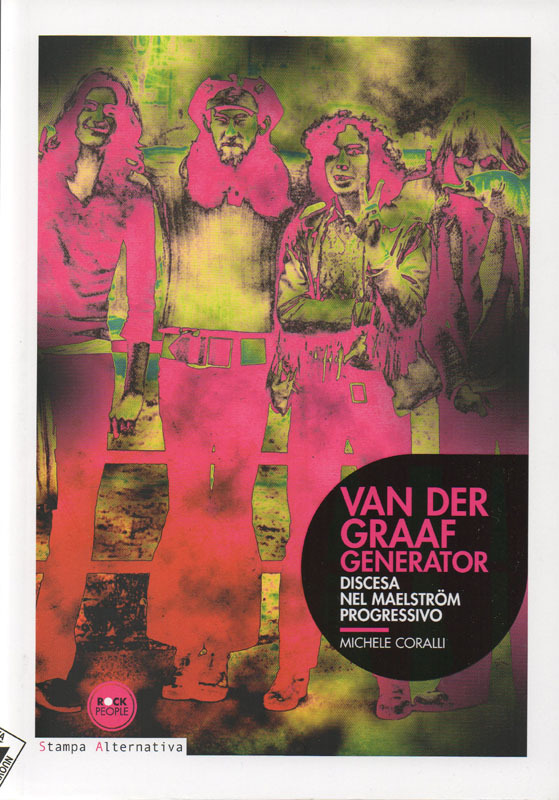 Also available from Voiceprint is the official DVD and CD of Van der Graaf Generator's show at the Paradiso in 2007. John (ny "Rotten") Lydon likes VdGG? 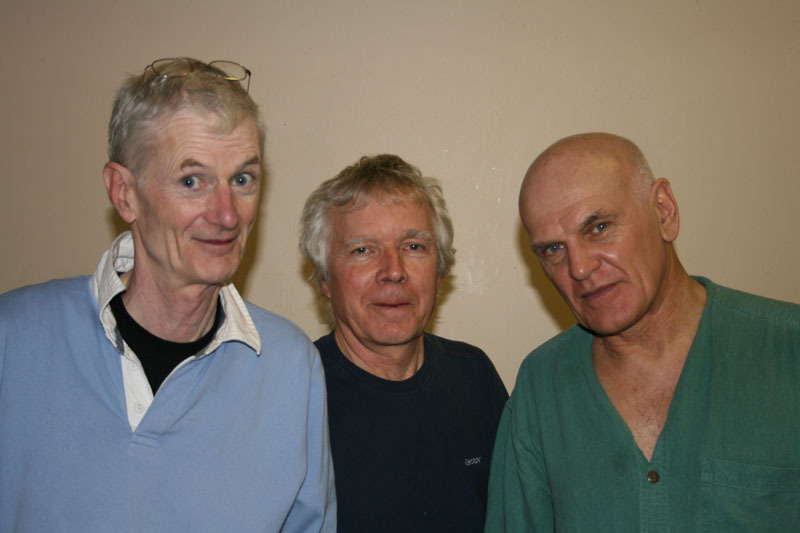 Van der Graaf Generator's 2009 tours: Click here for tour photos etc. Peter Hammill's new album is out. It's called "Thin Air". Which '70s prog rock band does Gordon Brown remind you of? Time Vaults has been released in re-mastered form by Plastic Head Records. This is much brighter and clearer than previous issues and worth the outlay. 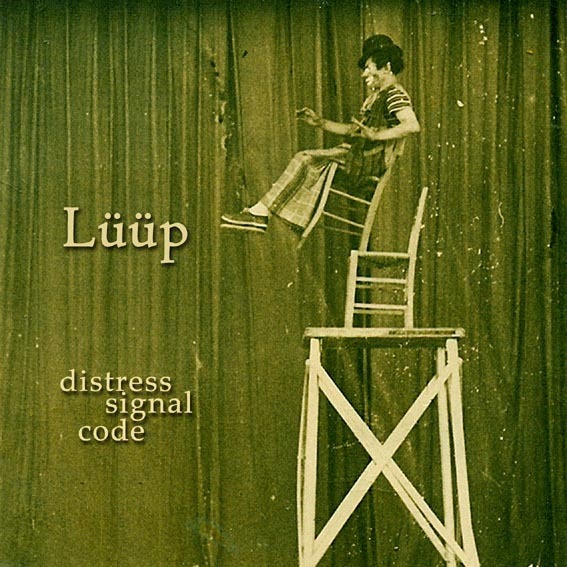 David Jackson appears on the first solo album from flautist Stelios Romaliadis, "LÜÜP", entitled Distress Signal Code. Buy it Here. "...where, finally, some lyric-labyrinthine adventures await." "Their research for this project has been diligent and wide-ranging and they've come up with a fascinating collection of interviewees and an even more fascinating range of photographs and other pieces of documentary evidence of all the lives and times of the band(s)." 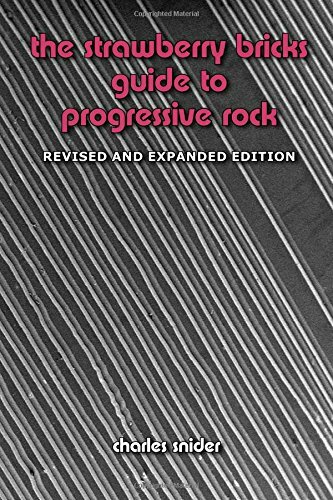 "I cannot recall being as excited about a book since Armando Gallo's Genesis book when I was 12 in 1978 or Mark Lewisohn's first Beatles Sessions." "Backed up by an abundance of documentation, photographs, and trivia... this thorough history balances the gravity of VdGG's music and their mostly difficult tale with a narrative of considerable exuberance." "...un'opera straordinaria, che si colloca fin da ora quale punto di riferimento assoluto sull'argomento." A K Group box set was released on 8th February 2019. "X", the new live album from PH, was released on 30th November 2018. 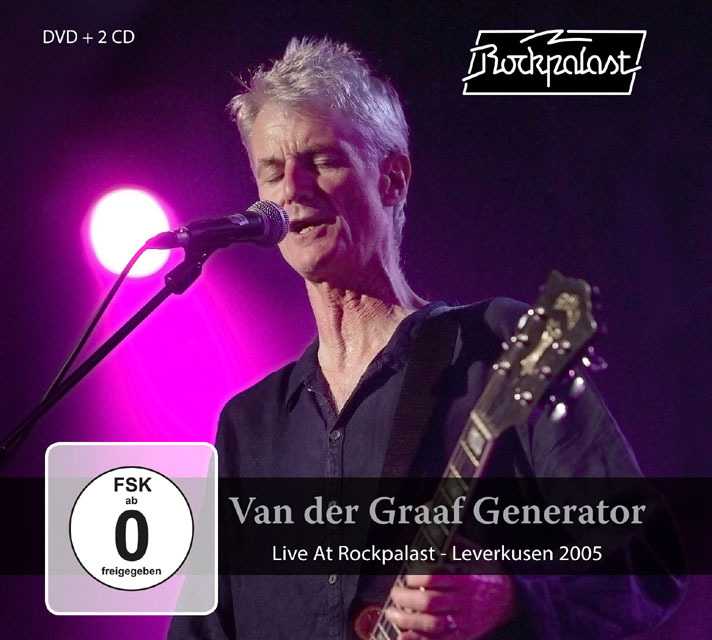 Live At Rockpalast: Leverkusen 2005 was released on DVD and CD on 25th May 2018. PH's new album "From the Trees" was released on 3rd November 2017. "Do Not Disturb", the new VdGG studio album was released on 30th September 2016. K Group live in Hamburg 1981 DVD was released on 26th August 2016. I am pleased to accept photographs and scans of artefacts for the website, but I would be grateful if you would contact me first before emailing very large attachments. I classify anything over about 10Mb as very large. Please keep sending stuff in, but bear this in mind. Thankyou. This was not intended as a comprehensive PH/VdGG site but is rapidly becoming one. 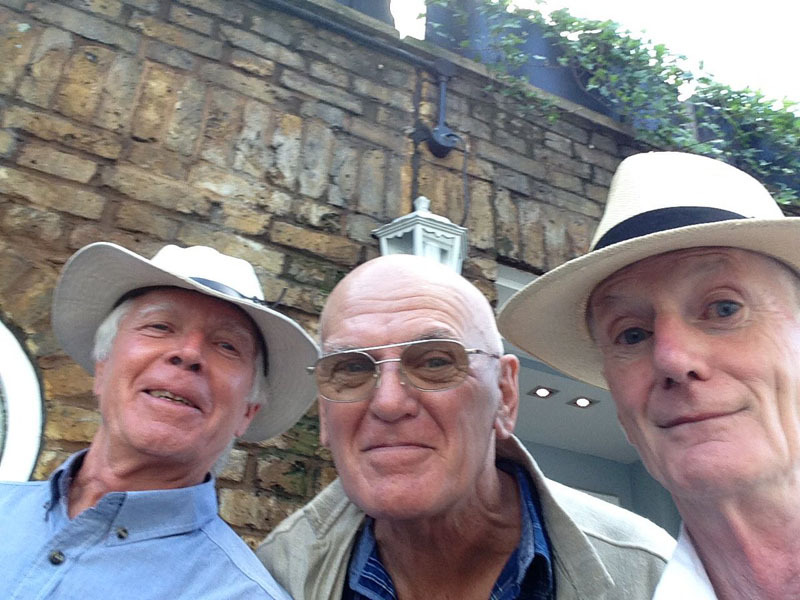 It started out as a personal journey through some very enjoyable times with my friends from the early to mid/late seventies but I have now incorporated much material donated from other sources to fill in gaps. There is material from 1967, when the band first formed, and onwards to 1978, when they finally split for what appeared to be the last time. 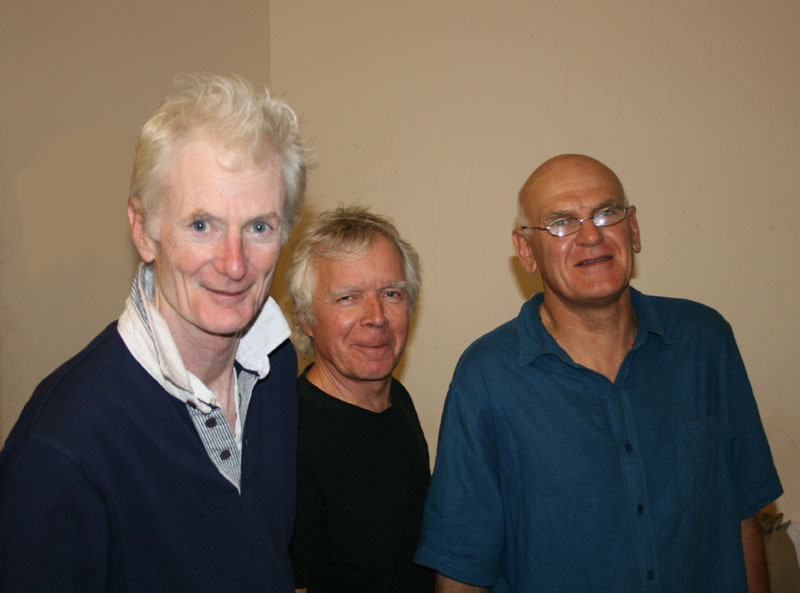 If you are a Peter Hammill and Van der Graaf Generator fan then you may well find something of interest here. The original band had actually split up by the time I got into the music and in fact the first album that I heard was "68-71", a compilation. The disappointment of not being able to see the band live in 1972 was tempered by the fact that Peter Hammill was by then a solo artist and performing around Europe, albeit sporadically. Often Dave Jackson, Hugh Banton or Guy Evans would support him, but long gone were Nick Pearne, Chris Judge Smith, Keith Ellis and Nic Potter. The band's first release was the single People You Were Going To, released in early 1969. The Early Days Read articles from the Manchester Independent and other publications from 1968 and 1969, and Hugh Banton's advert in the International Times of August 23rd 1968. Also Caleb Bradley and The Lost Demo Tape! Aerosol Grey Machine The album entitled The Aerosol Grey Machine wasn't originally released in the UK. It was the band's first album, recorded in 1969, but it only became obtainable in Britain in 1973 as an import, through Virgin (I think). 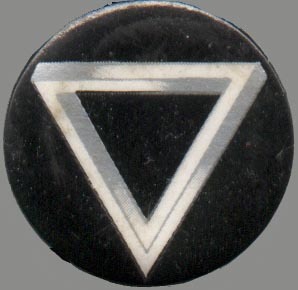 I can't remember if I got it from Virgin in Brighton (the first Virgin store which was a great place to hang out until they pulled the building down to make way for Boots) or by mail order. Either way it was the final brick in the wall and a great album as well. It has a good feel to it and is so late 60's. This album, among others, was produced by John Anthony. The CD, released in 1997, contains some interesting sleeve notes, penned by Peter Hammill, about the early history of the band; "you should get some flavour of the times". That sentiment fits well with the object of this site. See also other pictures and live reviews from 1971 and 1972. 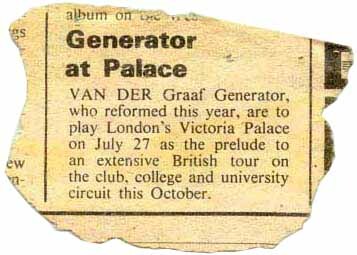 During 1972 Van der Graaf Generator toured extensively in Italy, had a Number One with Pawn Hearts and appeared twice in Ciao 2001 magazine, firstly in the 27th February 1972 edition and then later in June 1972. 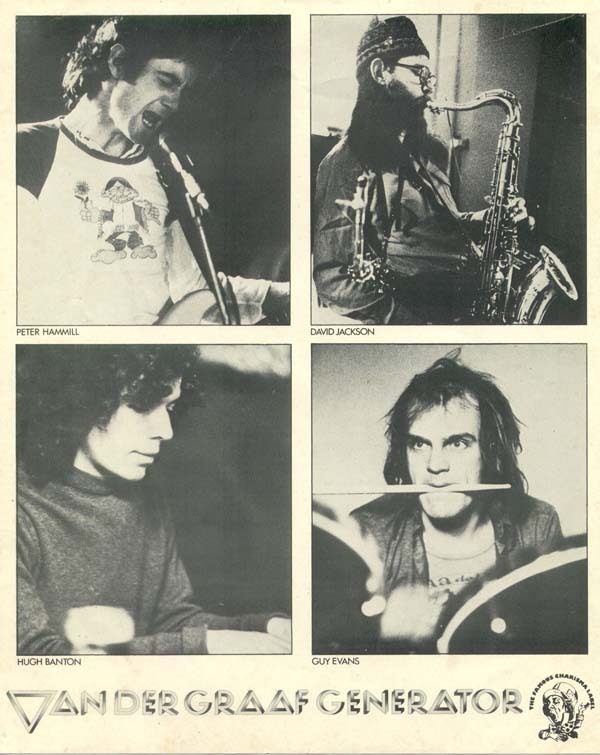 Peter Hammill also appeared in Ciao 2001 Magazine in December 1972. In the interest of man's thirst for knowledge and for those VdGG fans with an enquiring nature I provide you with this link to Boston's Museum of Science. If you ever wondered where the band's name came from or where the inspiration for many of the early album cover designs originated then pay it a visit. There are some stunning pictures, even of Robert himself! You can cut straight to the photo's by clicking here. Hammill on Playaway? Can this be? 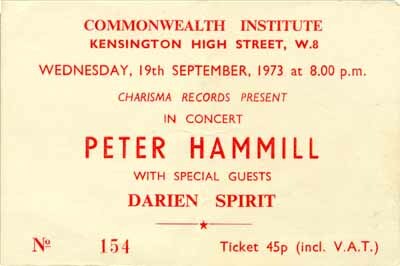 I don't remember all of the solo gigs but reckon that the first that I went to was at the Commonwealth Institute in 1973. Also in 1973 whilst at Brighton Poly, I introduced my room-mate, Richard McBride (Where are you Richard? - It's so easy just to slip away...) to Van der Graaf and to begin with, like most people, he found the music difficult to get into. One day I returned from college and heard "Refugees" wafting down the stairs. A new Hammill afficionado born. We went to several gigs together and had a habit of trying to get back stage to meet PH. On several occasions we succeeded and obtained the requisite autographs. The person to talk to of course was Gordian Troeller, Peter Hammill's manager (and later Van der Graaf's). Killers, Angels, Refugees, Peter Hammill's first book published in 1974, contains lyrics for all the songs up to "Silent Corner", poems, drawings and other interesting stuff. Richard could be quite funny and sent me this Christmas card many moon's ago that I came across recently. We, like many daft people still do, found PH/VdGG lyrics to suit any occasion. We knew all the songs by heart then, which would be difficult now with 40 albums to learn, and annoyed everybody with never ending renditions. In 1974 Richard moved to Hove to a 4th floor flat. Whenever we returned there from the pub just prior to staggering onto the final staircase we would chant "So onto the familiar top steps! in cloud-scud moonlight glow...the tower reels....". A bit silly really! 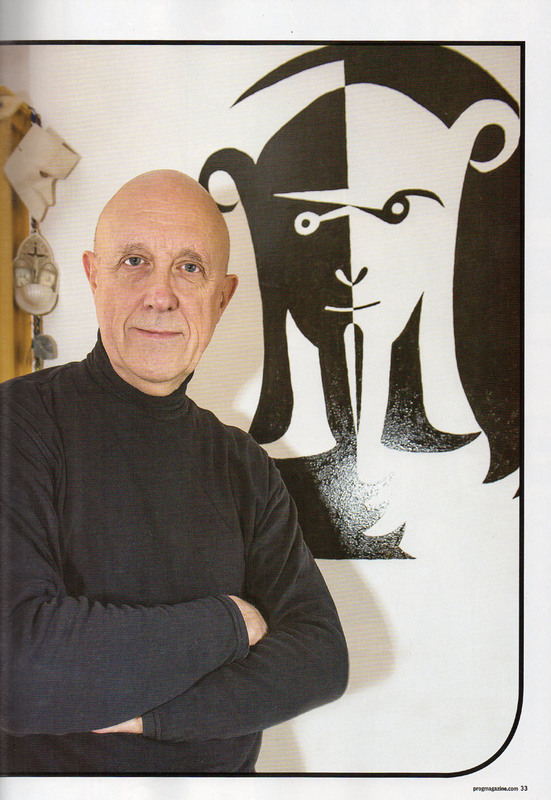 Interview with Paul Whitehead, cover artist. During 1973 the band, without Peter Hammill, but including Nic Potter, released an instrumental album called The Long Hello. The album wasn't released in the UK until 1976. Peter Hammill answered some questions from a Melody Maker reader in the March 27th 1976 edition which included comments about The Long Hello. Click on the paper to reveal. 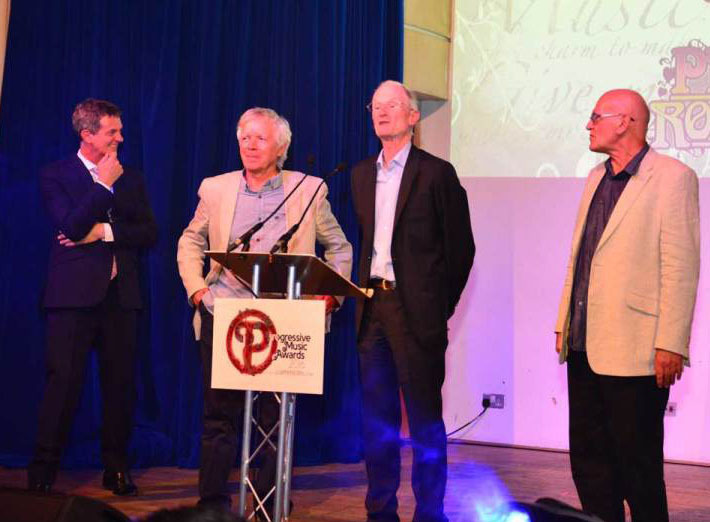 Jubilation abounded when in 1975 the band reformed with the classic line-up of Peter Hammill, Dave Jackson, Hugh Banton and Guy Evans. See Geoff Barton's interview of May '75. Following a couple of secret gigs in Wales, the band played in France and Belgium in mid-1975, then their "debut" in the UK being at the Victoria Palace theatre on the 27th July and a little later at the New Vic on August 30th. Great concerts. See also Antony Thorncroft's review in the Financial Times. Not quite as I remember it! It just shows how subjective reviews are. "There is a musical barrier which keeps out the trivial and the commercial, but also most of the threads that make for a worthwhile musical experience". Well, it was a worthwhile musical experience for me! The Charisma press release announcing the Oct/Nov 1975 tour also contained a VdGG biography and an article that appeared in The Times Educational Supplement entitled Defying Classification. The front cover sported an unusual picture, entitled "Band of Millions of Years", which was used to publicise the Godbluff tour and appeared on a compilation album cover. At this time I was studying at N.E.London Polytechnic along with several friends from home, one of whom was involved with the union at the Barking (mad) precinct. He was a budding journalist and set up an interview with the band. I went along as photographer and there appears below previously unpublished photographs of the band and the text of Tim's article. "The Machine that Cried" - Geoff Barton's piece in the Sounds of 25th October 1975. An event that has become part of the Van der Graaf legend was when their gear was stolen in Italy. 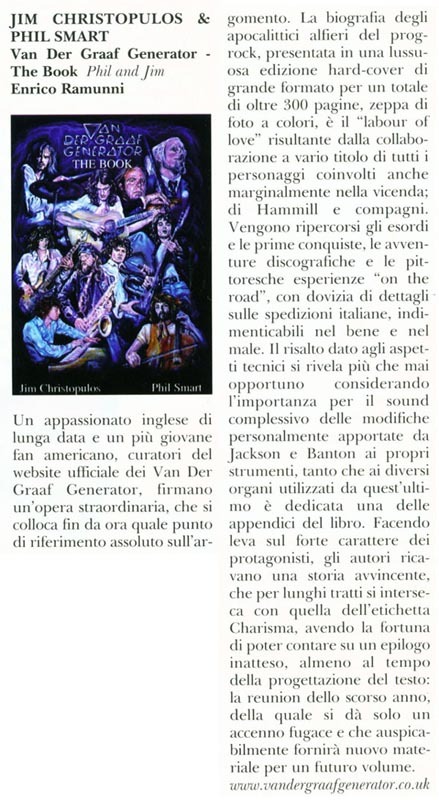 Van der Graaf Generator albums 1975 and 1976. Follow this link for Tim Locke's review of Godbluff and some photo's of the Still Life tour in 1976 with memories of the Sheffield concert, courtesy of Nick Huckle. 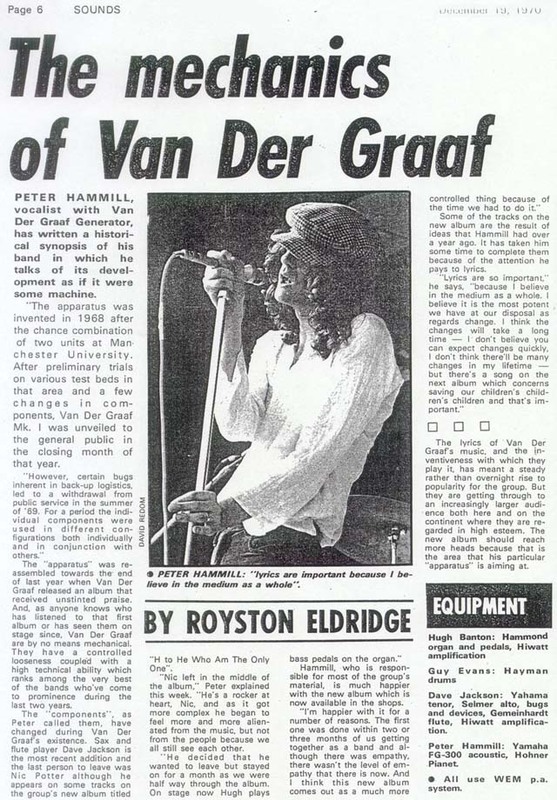 Van der Graaf played at the Reading festival in 1976. I was a regular frequenter of festivals at that time but for the first time I summoned up some energy and fought my way to the front. I was worried that they wouldn't prove popular with the crowd but I was wrong. Reading at that time was undergoing a transition between quiet hippy scene and bottle throwing football hooligan mayhem and anything could happen. The band played brilliantly and went down well. I heard Killer played live for the first time. I should have taken my camera. 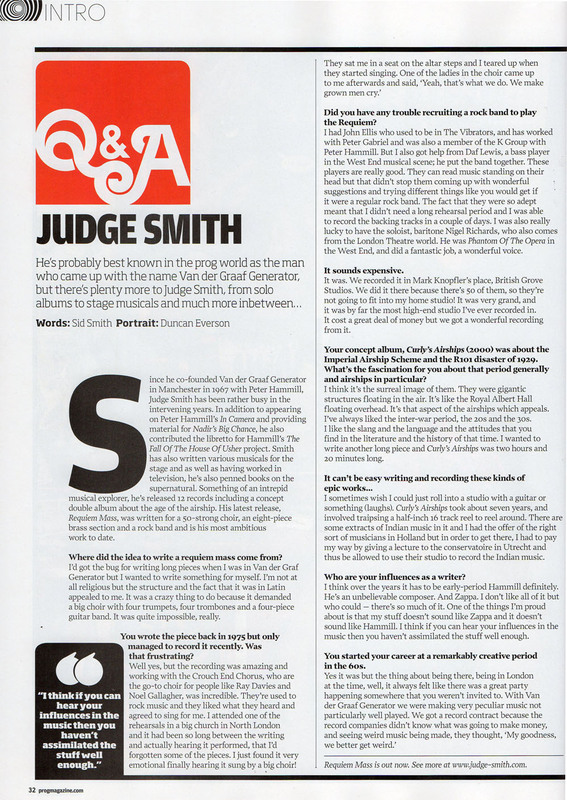 (Interestingly since I wrote the above words I found an interview by Geoff Barton, which mentions "old" Van der Graaf songs and in particular Killer, and whether the band would play them. The article has a certain relevance to Reading and you can cut straight to that section). Various people have reminded me that the band had a false start at Reading. Water had got into the electrics and the sound system didn't work. See Reading Festival for more details. 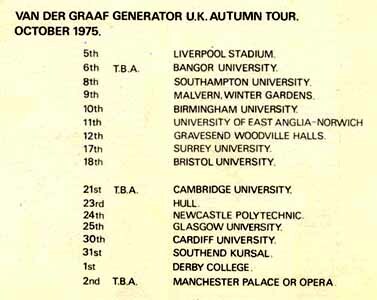 Van der Graaf Generator gigs attended 1975-1978. Then in early 1977, disaster struck! 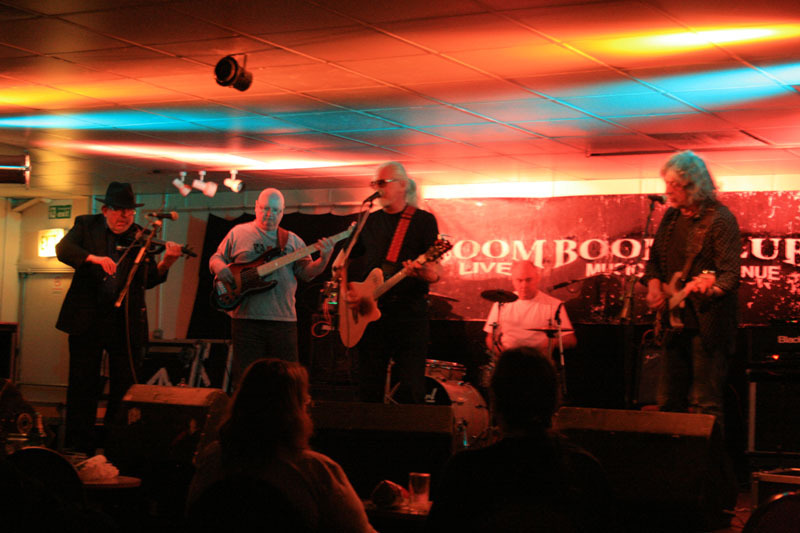 Hugh Banton and Dave Jackson left the band. All was truly lost....but no, they were to be replaced by long-term VdGG stalwart Nic Potter (on bass) and new-comer Graham Smith (ex-String Driven Thing) on violin. A short while later Charles Dickie, a cellist, joined the group. 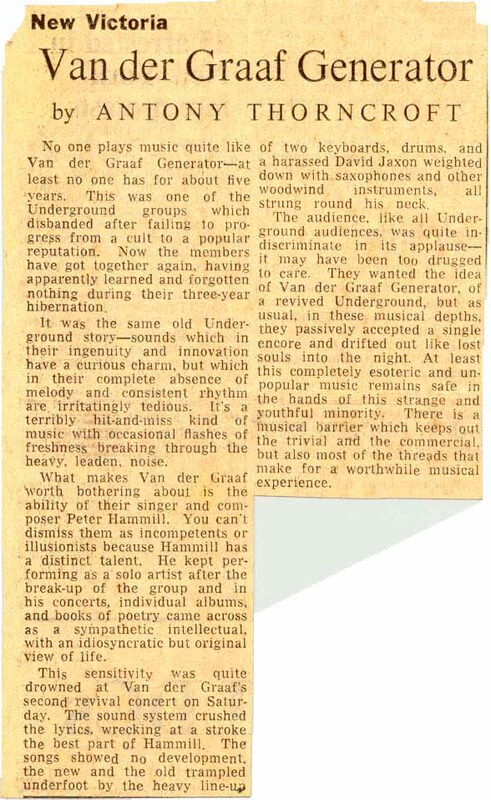 The band also underwent a name change to Van der Graaf. Well, I suppose we used to call them that anyway. And that's about it really. 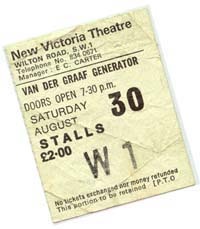 After Vital became the best selling Van der Graaf Generator album, in July 1978, the band split up and Peter Hammill resumed his solo carreer. Whilst putting this site together I came across a few mistakes that might amuse you, but Nobody's Perfect. "Pretty keen - yes, my hobby keeps me busy"
Copyright exists on EVERYTHING within this website. Do not reproduce ANYTHING without express permission. I have not intentionally infringed any copyrights myself. If you think that there is an issue then please e-mail me.